309 Commercial Real Estate & Properties in Melbourne City are listed in 5 categories. We have 299 OfficesSale & Lease , 7 Other Commercial PropertiesSale & Lease , 1 Retail ShopsSale & Lease , 1 Hotels and LeisureSale & Lease and 1 Industrial Warehouses Sale & Lease . Economical Workspace | Central Location | Modern Facilities $610pw | 3 Person Workspa..
PROPERTY OVERVIEW $610pw Price incl. Upmarket private offices at budget friendly prices in a shared workspace. These high quality private offices in Melbourne CBD’s legal and financial precinct are fully furnished and internet enabled with shared access to reception and kitchen facilities. Entering the office space, you’ll find an elegant waiting area with a manned reception and stunning lighting, which together create a beautifully professional first impression. Beyond that, you’ll find the available private offices for rent – 10 private offices sized for 3 4 people each, nine of which have windows – plus a smart kitchen. 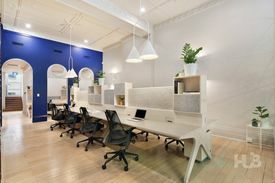 The fully furnished offices enjoy a wonderful flow of natural light and the modern fit out projects a faultless image for any professional services company, law firm, finance team or small business looking for office space in the ideal Melbourne CBD location. These private offices are available to be rented individually or in any combination with flexible terms starting from 1 month. Book a tour today to view these premium yet very affordable private offices in Melbourne CBD. 459 Little Collins Street is a 17 storey B grade building in the heart of Melbourne’s legal and finance precinct. Having undergone a number of renovations since its completion in 1969, including a total refurbishment with a premier modern fit out in the last three years. It has basement car parking and showers and is located on the corner of Gurners Lane and Little Collins Street, directly opposite the RACV Club. 459 Collins Street is well serviced by public transport and close to many of Melbourne’s laneways where you’ll find cute coffee houses, hidden bars and diverse cuisine. The advertised office space is perfect for a team of 3. If you need more or less space, we have over 30,000 furnished workspaces all over the world suitable for a team of 1 to 200+. Our award winning team offer a free service that will help you find the perfect solution for your needs, so reach out if you need more help. What you get for your weekly rent , Access to kitchen facilities , A fully furnished office suite , Building outgoings included , Commercial grade internet , Electricity usage included , One simple bill for everything related to your workspace , Premium coffee/tea facilities , Private lockable office , Secure high speed Internet Building features , Abundance of natural light , Air conditioning , Car parking in building (Paid) , Contemporary fit out , International hotels only 5 min away , Private offices and dedicated desks available , Retail and shopping malls nearby 180m to Collins St/William St Light Rail Station Opposite the Melbourne RACV Club 200m to Queen Street/Bourke Street Light Rail Station 450m to the Yarra River 400m to Woolworths on Bourke Street Who is Office Hub? Office Hub is the world\'s No.1 marketplace for office space. We have a huge global selection of coworking spaces, serviced offices and shared office spaces with flexible options to suit teams from 1 200 people. We\'ll take you on a tour of all the workspaces that fit your needs and work on your behalf to get the best price possible. We\'ll help you discover how shared office space can be the most beneficial and budget friendly solution for your business. www.office hub.com Conditions apply – the advertised price includes any incentives offered based on a 12 month agreement and is available to new tenants only. Please note that the rental rate may increase for a shorter rental period. A portion of the square meterage factors in access to shared space. Close To Public Transport | Vibrant Precinct | Cafes And Shops Nearby $300pw | 2 Person Workspa..
PROPERTY OVERVIEW $300pw Price incl. Fantastic opportunity to set up your office with spaces from 2 person to a massive 30 person office with private facilities in Melbourne CBD! Affordably priced with outgoings of bodycorp, electricity and water included in the monthly rate, this stylish unfurnished office provides a wonderfully private, professional and cost effective business environment. The space is centred around a large open plan workspace with the rest of the floorplan divided into six offices, a six person boardroom and private kitchen and toilet facilities. Don’t miss this unique opportunity – it won’t be around for long! This boutique office building is situated on a bustling pedestrian lane known as one of Melbourne’s best foodie streets with famous brunch spots such as The Hardware Society and Hardware Street Cafe. Just steps from Melbourne’s legal precinct, the building has a welcoming glass roof atrium with a newly refurbished foyer as well as ground floor security, bike racks and 24/7 access. As for the commute, this prime CBD location has excellent public transport access and street and public parking can be found nearby. The advertised office space is perfect for a team of 2. If you need more or less space, we have over 30,000 furnished workspaces all over the world suitable for a team of 1 to 200+. Our award winning team offer a free service that will help you find the perfect solution for your needs, so reach out if you need more help. What you get for your weekly rent , 24/7 Access , 24/7 Security , Private kitchen & bathroom facilities , Building outgoings included , Electricity usage included , Flexible terms , Regular cleaning , Private use of your own six person boardroom , A prestigious address to put on your business cards , Secure high speed Internet (additional cost) , One simple bill for everything related to your workspace Building features , Air conditioning , Bike racks , Ground floor security , Natural light , Professional environment , Direct access to public transport , Car parking Street / Public Car Park (Paid) , Company Branding at reception 200m to Melbourne Central Train Station 700m to Queen Victoria Markets 800m to Chinatown Melbourne 250m to the Legal Precinct of Melbourne Who is Office Hub? Office Hub is the world\'s No.1 marketplace for office space. We have a huge global selection of coworking spaces, serviced offices and shared office spaces with flexible options to suit teams from 1 200 people. We\'ll take you on a tour of all the workspaces that fit your needs and work on your behalf to get the best price possible. We\'ll help you discover how shared office space can be the most beneficial and budget friendly solution for your business. www.office hub.com Conditions apply – the advertised price includes any incentives offered based on a 12 month agreement and is available to new tenants only. Please note that the rental rate may increase for a shorter rental period. A portion of the square meterage factors in access to shared space. Contemporary Office Space | Reception Services | Impressive Location $809pw | 5 Person Workspa..
PROPERTY OVERVIEW $809pw Price incl. Contemporary and stylish serviced office space in the heart of Melbourne. Price incl. Electricity, Building Outgoings & Cleaning Flexible terms 24/7 Access Dedicated Receptionist Amazing Collins Street Location Avail NOW for short or long term rent Situated in the centre of Collins Street, these offices create a modern, professional environment perfect for any small business. Conveniently placed in Melbourne's prime retail and cafe precinct, tenants will have access to a variety of amenities in the area. The free tram zone on your doorstep provides a quick and easy way to get to external meetings around Melbourne's CBD The advertised office space is perfect for a team of 5. If you need more or less space, we have over 30,000 furnished workspaces all over the world suitable for a team of 1 to 200+. Our award winning team offer a free service that will help you find the perfect solution for your needs, so reach out if you need more help. What you get for your weekly rent Furnished office with desks, chairs and lock up storage units Commercial grade internet available All outgoings including air conditioning, heating, electricity lighting and daily office cleaning Receptionist and administrative support Access to IT support Access to fully equipped meeting/training rooms Prestigious business address to put on your cards Flexible terms from 1 month 2 years 24 x 7 access to your office 24 x 7 security Office features Full mail management and processing Shared kitchen Air conditioning in all offices Professional and friendly environment Quality & modern furniture fully furnished Building features Shower facilities in building Bike racks and lockers in building Parking in building and surrounding areas Dedicated on site management team 50m to bars and cafes 50m to Collins Street Trams 200m to Yarra River 400m to Flinders Street Station 400m to Bourke Street Mall Who is Office Hub? Office Hub is the world\'s No.1 marketplace for office space. We have a huge global selection of coworking spaces, serviced offices and shared office spaces with flexible options to suit teams from 1 200 people. We\'ll take you on a tour of all the workspaces that fit your needs and work on your behalf to get the best price possible. We\'ll help you discover how shared office space can be the most beneficial and budget friendly solution for your business. www.office hub.com Conditions apply – the advertised price includes any incentives offered based on a 12 month agreement and is available to new tenants only. Please note that the rental rate may increase for a shorter rental period. A portion of the square meterage factors in access to shared space. Modern Utilities | Professional Space | Convenient Location $382pw | 5 Person Workspa..
PROPERTY OVERVIEW $382pw Price incl. Colourful yet corporate managed office in the heart of Melbourne CBD. This business centre provides professionally fitted and furnished offices and suites to meet any small business requirement for between 1 10 people. The cool style is designed to power up your productivity and creativity while smooth management supports your administration and reception tasks. With internet, phone number, directory listing and IT support, this serviced office has everything you need to take your business to the next level. This iconic Melbourne office tower is located right by the CBD’s lovely cafe scene at Degraves Street and close to the retail heart of the city at Bourke Street Mall. Collins Street is highly regarded for its strengths in attracting high quality commercial tenants so this is a fabulous opportunity to place your business next to a range of high profile businesses. On top of that, there’s in building parking and a dedicated onsite management team to support your every need. The advertised office space is perfect for a team of 5. If you need more or less space, we have over 30,000 furnished workspaces all over the world suitable for a team of 1 to 200+. Our award winning team offer a free service that will help you find the perfect solution for your needs, so reach out if you need more help. What you get for your weekly rent Furnished office with desks, chairs Commercial grade internet service Telephone number & Handset Ability to bring your existing phone number over Dedicated Receptionist with phone answering Directory board listing Administrative Support Access to IT Support Access to fully equipped meeting/training rooms for up to 24 people Unlimited use of the kitchenette facilities with coffee/tea Prestigious business address to put on your cards Flexible terms from 1 month 2 years 24 x 7 security Office features Air Conditioning in all offices Professional and friendly environment Quality & modern furniture fully furnished Building Features Parking in building and surrounding areas Dedicated on site management team 50m to Bars and Cafes 200m to Yarra River 400m to Flinders Street Station 400m to Bourke Street Mall 50m to Collins Street Trams Who is Office Hub? Office Hub is the world\'s No.1 marketplace for office space. We have a huge global selection of coworking spaces, serviced offices and shared office spaces with flexible options to suit teams from 1 200 people. We\'ll take you on a tour of all the workspaces that fit your needs and work on your behalf to get the best price possible. We\'ll help you discover how shared office space can be the most beneficial and budget friendly solution for your business. www.office hub.com Conditions apply – the advertised price includes any incentives offered based on a 12 month agreement and is available to new tenants only. Please note that the rental rate may increase for a shorter rental period. A portion of the square meterage factors in access to shared space. Modern Commercial Building | Cafes And Shops Nearby | Fully Furnished $2202pw | 15 Person Works..
PROPERTY OVERVIEW $2202pw Price incl. Brand new coworking space in Melbourne CBD available from August 2018. This dynamic workplace is curated for the grownup coworker with impeccable styling, inspiring breakout areas and an abundance of equipped meeting spaces – it’ll motivate your team and impress clients regardless of your size or industry. The world leading provider offers reception and admin support with a focus on building a close community around collaboration and connectivity. Cost effective and flexible terms – sign up now to reserve your office space and be the first to benefit from this amazing environment. The T&G Building is an esteemed heritage building on the prestigious Collins Street. It has an incredibly rich history as the most prominent interwar office address in Melbourne and is just as sought after today with tenants such as Google, Nike and Accenture – this space gives the opportunity to work alongside global innovators at a fraction of the price. The T&G Building features both a classic corporate entry and a vibrant pedestrian entrance into a renovated foyer with club style concierge as well as 6 star end of trip facilities and an inhouse wellness centre. The location at the Paris End of Collins Street puts you right in the mix of Melbourne’s laneway atmosphere with tempting shopping, dining and entertainment nearby. The advertised office space is perfect for a team of 15. If you need more or less space, we have over 30,000 furnished workspaces all over the world suitable for a team of 1 to 200+. Our award winning team offer a free service that will help you find the perfect solution for your needs, so reach out if you need more help. What you get for your weekly rent , 24/7 Access , 24/7 Security , Access to kitchen facilities , Building outgoings included , Commercial grade internet , Electricity usage included , Regular cleaning , Worldwide access to boardrooms, meeting rooms and day offices , Access to secure printer and scanner , Flexible lease terms from 1 month Building features , Cafe/restaurant onsite , Showers , Impressive A grade foyer and fitout , Car parking in building (Paid) , Company Branding in Foyer & Reception , Concierge on ground floor , Landmark building in the heart of the city 230m to Town Hall tram staion (Stop 6) servicing the following routes: 11,12,48,109 110m to Grand Hyatt Melbourne 500m to Flinders Street Station 250m to a multitude of bars including: Gin Palace, The Crafty Squire, Izakaya Den and The Carlton Club WHO IS OFFICE HUB? Office Hub has largest collection of shared office space, sublet office space, creative coworking office space and serviced offices, perfect for 1 200 employees. Let us take you on a tour of all the spaces that fit your needs and budget. Our service is complimentary and we work for you and the landlord to negotiate the most competitive deal in the market. Let us show you how shared and serviced offices can be the perfect solution for your business. All pricing shown excludes any local taxes such as GST or VAT Conditions apply A portion of the square meterage factors in access to shared space. The advertised price includes any incentives offered based on a 12 month agreement. If a shorter period is agreed to please note the price may increase accordingly. This promotional offer for new tenants only and may be withdrawn at any time due to space availability.